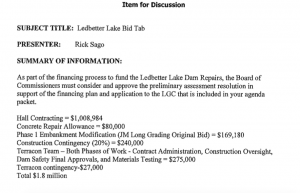 The Board of Richmond County Commissioners could take the next step in repairing the Ledbetter Lake Dam on July 7 by approving a preliminary assessment resolution and awarding the repair project to contractors. The meeting is scheduled to begin at 5:30 p.m. Tuesday at the County Administration Building, 125 S. Hancock St., Rockingham. The meeting is open to the public. County officials will conduct a public hearing on this same topic, at the same location, at 7 p.m. on Tuesday, Aug. 4. This image and projection of work to repair the Ledbetter Dam is on file with the application with various state agencies. County Manager Rick Sago said in April that the county is not pledging its revenue on the loan to fund the project. The burden, he said, is on the property owners surrounding the lake. Sago said property owners will have a significant incentive to pay. “We have pledged we will foreclose on (the) property if they don’t pay their assessment,” Sago said during the April meeting. 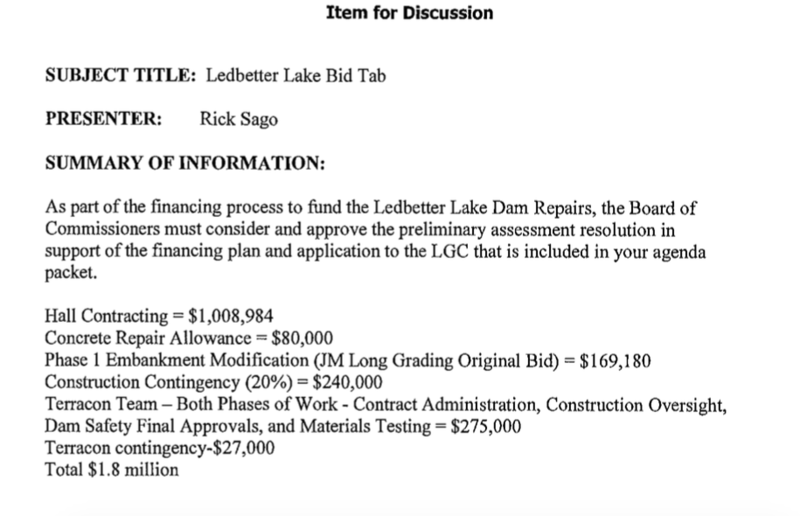 A breakdown of bid amounts and contractors expected to be a part of the Ledbetter Dam repair project. Click on image for larger version. The cost of the project has increased in the past year to $2.7 million, which includes the design, planning and permitting, as well as improvements, construction and costs related to the financing of the project,” according to the informational packet prepared for commissioners. The county, in turn, will levy assessments on affected property owners that will be payable in up to 15 annual installments. Assessments will bear interest at a rate not exceeding 8 percent. An initial survey indicated 67 percent of affected property owners supported the project and agreed to pay their fair share of its cost. A second survey indicated that of 83.4 percent (101) of 121 owners of affected parcels have signed onto to the project. Another three entities — including American Legion Post 147, Queensdale LLC — indicated an official “no decision” on four affected parcels. In addition, owners of 16 parcels have agreed not to sign while seven others offered no response. Any agreement endorsed by the county commissioners is subject to the approval of the Local Government Commission. 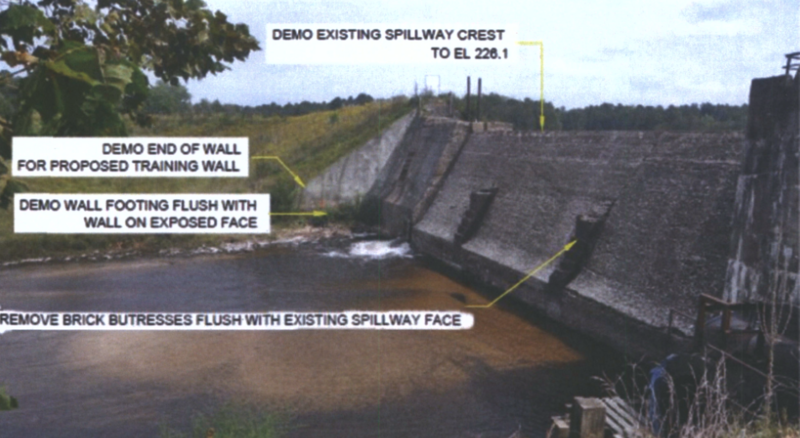 North Carolina dam safety inspectors examined Ledbetter Dam in April and July 2012 and issued a Notice of Deficiency on July 20, 2012, that identified several problems and maintenance issues that could result in dam failure during high flow events or seismic activity. 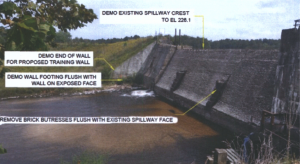 Reported problems include cracks and leaks on the left side of the spillway, concrete deterioration, seepage through the embankment, stability of the embankment and much more. The notice instructed the owner to prepare and emergency action plan and to draw down the lake at least 5 feet until permanent repairs are completed. The lake was drawn down to the lowermost gate to remove accumulated logs and debris in 2013. No way no how should public taxpayer money be spent on this project unless there is public access to the lake. There is not public taxpayer money being spent; the article I wrote attempts to make clear the burden of paying the loan falls on the affected property owners. that is what the public hearing at the beginning of the meeting at 5:30 is for. To let the landowners speak. You should be there before 5:30. Didn’t understand we could speak @ that time, Thanks Fred. you may be limited to 3 minutes of speaking per person. You can call 997-8211 during 8:00-5:00 and ask more questions about length of time speaking per person, etc.